Human-elephant conflict on the decline? The earliest known inhabitants of Namibia are the San (Bushmen), who belong to the Khoesan peoples. Generally short in stature, they have light yellowish-brown skins, while their language, which differs among the different groups, is characterised by numerous clicking sounds. These hunter-gatherers – which include the Ju/’Hoansi, Kxoe and !Kung – roamed the vast plains of Southern Africa for thousands of years before migrants armed with weapons and searching for new land on which to graze their animals and plant their grain, drove them further and further east into the Kalahari Desert. Most San people now live or work on farms in eastern Namibia or live in remote communal areas in Otjozondjupa and Omusati. There are approximately 35,000 San people in Namibia. The wealth of rock paintings and engravings found in mountains and hills throughout Namibia bear witness to the Bushmen’s former habitation in many parts of the country. The oldest rock art dates back some 28,000 years. Examples are the famous White Lady painting of the Brandberg and the rock engravings at Twyfelfontein, one of the richest collections in Africa. Renowned as great storytellers, the San express themselves eloquently in prose, music, mimicry and dance. Their simplest instrument is the hunter’s bow, strung with animal hair and played with a hollowed-out melon or an empty tin can as a sound box. Moth cocoons filled with stones or seeds are attached around their ankles to provide rhythm while they dance. The San are divided into three groups: the Hai||om (who traditionally inhabited Etosha) in the northern districts of Otavi, Tsumeb and Grootfontein; the Qgu (!Kung) and Ju/’Hoansi in Bushmanland and the Gobabis District; and the Khoé or Mbarakwengo in West Zambezi. While a small number of these legendary people still practise their traditional, nomadic lifestyle, the majority lead a settled existence in villages, having been influenced by Western culture, economies and lifestyles. 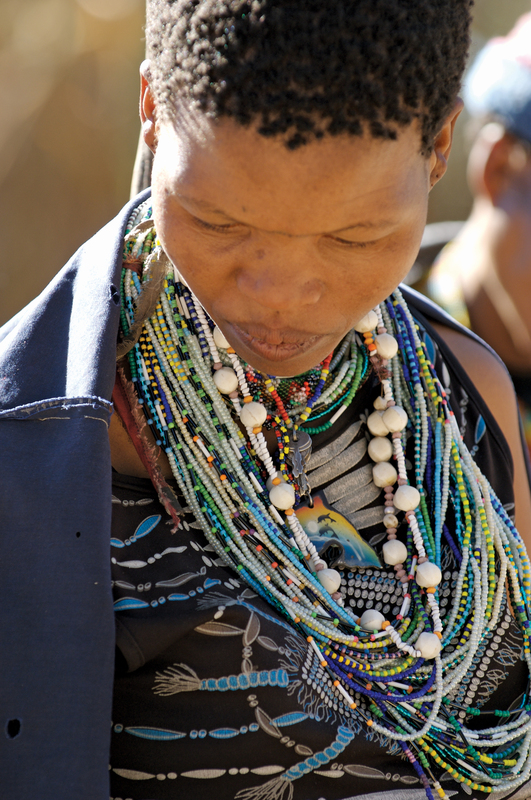 For centuries, the San have adorned themselves with beadwork. Glass beads were traded or new beads were fashioned from ostrich eggshell. The techniques of making jewellery and other items such as collecting bags from animal skin, have changed little. Production of such items is often shared. Beads, for example, are carved by the men and threaded by the women. Most materials used, such as seeds, segments of porcupine quills, nuts, roots and berries, are collected in the bush. Functional items, such as bags traditionally used for collecting wild fruit and berries, or storing tobacco and matches, are made from softened antelope skin. Crafts produced in the Omaheke Region are marketed by the Omaheke San Trust, an organisation that provides a livelihood to hundreds of marginalised Bushman families living in the region. G!hunku Crafts is situated next to the Nyae Nyae Conservancy office in Tsumkwe, well positioned for tourists to stop by on their way to Botswana or the Khaudum National Park. This is a community-based craft project selling traditional San ostrich eggshell and tamboti-wood jewellery, amongst other traditional items. The striking Art-i-San beaded artwork and ostrich-eggshell jewellery made by San communities in the Omaheke Region can be bought from the Namibia Craft Centre in Windhoek. Started in 2008 as a small project to provide an alternative source of income to rural poor and marginalised San women, Baraka Beads combines the existing artistic beading skills of the Ju/’Hoansi San with modern, contemporary designs. Living open-air museums where visitors can learn about the traditional culture and original way of life of Namibia’s indigenous peoples are truly ‘Living Museums’. The aim is to generate an income for the community involved and to keep traditional, rapidly vanishing cultures alive by showing and demonstrating traditional dances, music instruments and habits. The first such facility established in Namibia was the Living Museum of the Ju/’Hoansi-San at Grashoek, which opened in 2004. The San living in this area are the only Bushmen still allowed to hunt traditionally. Apart from learning about the ancient culture of the Ju/’Hoansi, native to the Kalahari Desert for thousands of years, the focal point is experiencing a real hunt with hunters from the Living Museum. The traditional bow hunt with poisoned arrows, digging out springhaas (spring hares) and porcupines, and catching guinea fowls, korhaans and other birds in snares for food was never halted. In 2010 a second one, the Living Hunter’s Museum of the Ju/’Hoansi-San, near Tsumkwe, was opened. This museum also gives visitors to the former Bushmanland tribal area first-hand experience of the traditional hunter-gatherer lifestyle of Namibia’s earliest ancestors, and the opportunity to meet traditionally dressed Ju/’Hoansi-San people, and learn about their culture through demonstrations of what it takes to survive in the wild armed with only a bow and arrow, a digging stick and an intimate knowledge of the environment passed down for generations. Accommodation is provided at the Elephant Song Campsite. A basic campsite is situated in a glade in close proximity to the Living Museum and Craft Shop, a worthwhile stop in the middle of the Kalahari. Apart from the fascination that an indigenous San lifestyle holds to visitors, the attraction of this area lies in its unspoilt nature. It provides a true bush experience, as there are no ablution facilities and no running water or electricity. Programmes include bush walks with hunting, snaring, tracking and collecting bush food; singing, dancing and games around the fire; demonstrating how traditional Bushman crafts are made; action days; and two-day walks into the wild, guided by Bushmen. Situated off the C44, 87 km on the way to Tsumkwe, Omatako Valley Restcamp in the Otjozondjupa Region is a !Kung Bushman/San community campsite offering bushwalks on which traditional bush food and medicines are pointed out and tracking knowledge is shared. Added attractions are a village tour visiting houses around the campsite, and viewing traditional singing and dancing. Tsumkwe is situated in the middle of the Nyae Nyae Conservancy, where residents have the right to manage their wildlife and natural resources themselves. South-east of Tsumkwe is the Djokhoe Campsite, situated near the Holboom Baobab, and further east is the Mukuri Campsite. The area has several pans that attract birds and wildlife. For a good Bushman/San experience, Sãa Ta Ko in the extreme east close to the Botswana border, is situated a short drive past the Corridor 13/Motsomi town. Bush walks, a visit to the San demonstration village, and singing and dancing are the highlights of a visit to the campsite, as is the opportunity to have a San experience on San land. 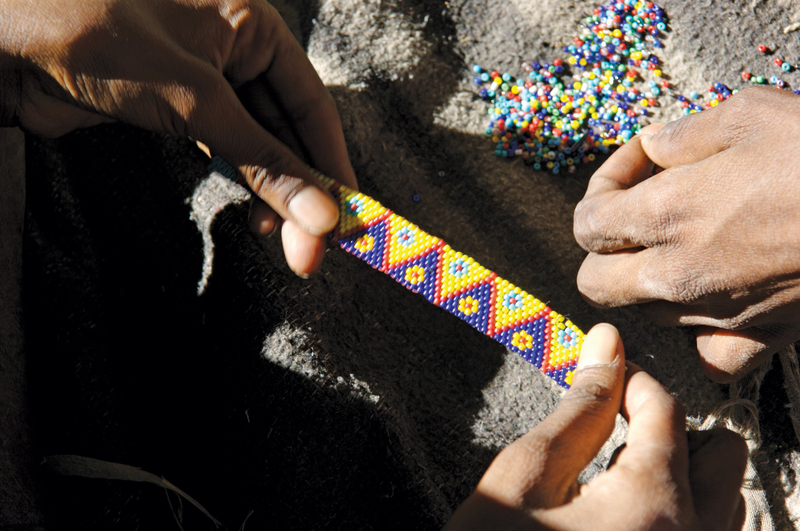 The San still practice a century-old tradition of intricate beadwork. Beads used for making jewellery and crafts are made most often from glass and eggshell.